I've never been good at doing holidays. I'm a classic under-buyer, so I hate spending money on decor. I'm a very type B personality, and love winging it when it comes to plans. So what ends up happening is that a holiday rolls around, and I haven't decorated, haven't done any seasonal activities with my kids, and haven't prepared how we're going to celebrate. And then I feel regretful and jealous of the people on Instagram who had their act together enough to visit a pumpkin patch or take their kids to see the Christmas lights or bake holiday themed cookies. I was sick of feeling like the holidays we're passing me by while I stood there feeling frantic. Then I stumbled across this podcast episode and this corresponding blog post, and all that changed. I realized that although planning ahead goes against my nature, I did need a small dose of it in order to feel content and peaceful during the notoriously hectic holiday season. So yeah. No one is as shocked as I am that I have a holiday game plan. But so far it seems to be working! I feel no jealousy when I see other people post on Facebook or Instagram. I am calmly looking forward to the events we've added to our calendar, and happily saying no to the events and activities we've opted out of. And the difference is that it's intentional. Ok, enough rambling. I'm going to share what we're saying no to this holiday season, what we did add to our schedule, and one holiday hack. What we're saying NO to. decorating the entire house - listen guys. I'm not a scrooge. I love a well-decorated house for the holidays. If any of my lovely readers that I know IRL have ever been to my parents' house during Christmas season, you probably thought you were literally in the North Pole. My mom is a Christmas genius. I, on the other hand, do not have an eye for decor. We're still renting, and I am choosing not to spend tons of money on holiday decorations. I eagerly await the day we buy a house so I can spend money on cohesive holiday decor, but until then, I'm just changing out one mantel for each season. It works for me right now. holiday crafts with the kids - because it's not my scene. Nope. Not doing it. Black Friday shopping - I used to do this with my mother-in-law and sisters-in-law when we lived near them. I loved the bonding time with them, and letting our husbands take care of the kids. Now that we live far away and don't see them at Thanksgiving, I don't have any desire to head out into the craziness. Bonus - I'm saving money! traveling for the holidays - I'm actually really sad about this one. This is the first time anyone in my family has missed Christmas morning at my parents' house. However, with three really young kids, and a relatively short Christmas break, we decided it would be best to stay home and create some of our own family traditions this year. Friendsgiving - as I mentioned above, we live far away from our families, and won't be heading back for Thanksgiving or Christmas tis year. So we're hosting some friends for Thanksgiving dinner and we're keeping it super low key. Like, we're not even making a turkey. Rotisserie chicken and mashed potatoes, anyone? Seeing Christmas lights with the kids - I've checked the schedule and location ahead of time (who am I? ), it's written on the calendar, and now we get to talk about it and look forward to it for a few weeks! Baking Christmas cookies - frosted sugar cookies and candy cane cookies. It's going to be magical and delicious. Sending a Christmas letter - this year we're skipping the printed cards with some festive message on them. Instead I'll be writing a Christmas letter to our friends and family, and including just a plain old picture of our family. Easy-peasy, and once again, saving money! This year I'm setting my New Years intentions early. I've been really focused on sticking to our budget and saving money, I'm part of an accountability group (Healthy Holiday Tribe) to stay on track with my health during the holidays so I can lose the last few pounds/inches of baby weight, and I've been ramping up my efforts in blogging and my health and wellness business. It's really tempting to push things off until January because it can be so overwhelming to think about one more thing during this time of year. However, having a jump start on my goals makes me feel more content and in control right now. Hopefully this is helpful to anyone dreading the chaos of the holiday season. You have permission to keep it simple and to say no to things that aren't as important to you, or that will make you too crazy. Trust me, everyone will appreciate a happier and calmer version of you, and you get to focus on gratitude, joy, and peace. 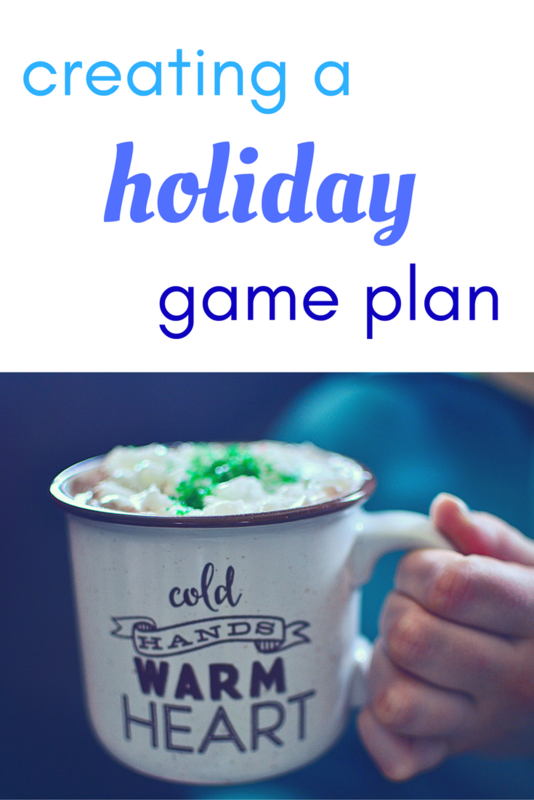 What are you including in your holiday game plan? Looking to simplify staying healthy during the holidays? Join the Monday Morning Sessions for weekly tips and inspiration to your inbox.